I have got rather behind with reading the blogs I follow but must recommend you visit Julie (click on the link and then on "newer post" to see her four posts covering different aspects of the show) and Carin (then newer post for all five posts) for great coverage of the Tokyo International Great Quilt Festival. I find it very interesting that there is little overlap in the quilts Carin and Julie have shared, down to their own personal preferences and particular skills and interests in the field of textiles. Also how some of the quilts instantly say "Japanese" while some appear more western in style to me, such a fantastic range of work and so much of it done completely by hand. 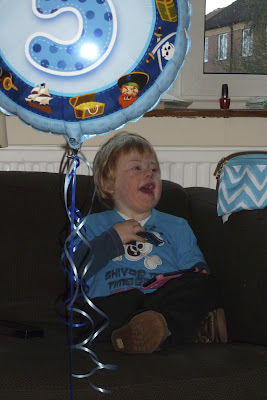 While I haven't been reading blogs I have been stitching and also spending time with DGS Sam who turned 5 on 30th January. Cue photos of my gorgeous boy! The Wedding Quilt is coming along quite nicely although I did have some hassle with one seam which I restitched THREE times. I still don't know what went wrong but it's okay now thank goodness, must have been gremlins in my brain cell! I checked on their bed size with DS and he said it's a double although they are planning to get a larger bed when they can afford it - okay darling, I'll make the quilt larger in anticipation of the new bed. I'll post a photograph when I have some daylight to take one in. It's currently snowing hard, with very large flakes and lots of wind - very soon time to head for my cocoon I think! Happy Birthday, Sam. looks like a great time was enjoyed by all. Wonderful photos of Sam! Happy Birthday Sam! There are too many quilts in the quilt show to feature all. You are right, we do tend to take photos of the style we like. I have since found some other blogs with OTHER pictures! I'll put the links on my page. Happy grandmother to have such a Happy grandson. Happy Birthday, Sam! What a wonderful excuse to take off from a bit of blogging! Such a happy family time!